So, we’ve made it through the festive season. Christmas lights and decorations have vanished from view. It’s cold and still quite dark come 4pm – and our bank accounts are a bit dry and low. Some of you will have made resolutions of sorts for January (‘Dry January’, ‘Januhairy’ or new gym goals to let go of that festive weight). Research suggests that in the UK, January can feel like the gloomiest month of the year. So, to liven things up this month, here are a few top tips for things to do on a budget. It seems at this time of year, personally, I am never prepared for the cold, or the clothes I have don’t do it for me. While magazines and social media networks are promoting the latest styles that none of us can afford, have a look through the racks at your local charity shops – you’ll be surprised by the gems you’ll find there. I once found a DKNY Leather jacket for £30! No, it wasn’t pleather! One person’s used is another person’s new! And, before you turn your nose up at it, TK MAXX is always brimming with designer brands without you realising. Yes, London is the most expensive place to live in in the UK. So while you’re paying rent, why not become a tourist for the day and visit the incredible things London has to offer for free. If you’re not sure what these might be, start with the Natural History Museum or London’s Street Art, where you’ll find some glimpses of Banksy. Yes, this sounds lazy, but what is more enticing when it’s cold outside? Snuggling up under the duvet with your slipper socks and striving for that automated message to pop up on your screen from Netflix, asking ‘Are you still watching?’ If you missed it last week, the new season of Luther is a killer and on BBC iPlayer as well! It’s like they know you’re planning on staying in during January. As you’re probably living in a flatshare owned by a landlord that doesn’t allow pets, a sneaky way to fill the animal void in your life is through BorrowMyDoggy. You know that feeling when you’re a teacher and you love kids, but thankful to hand them back at the end of the day? It’s like that but with cute furry dogs! Doesn’t cost you a thing. This takes more time than it does money. So, when you’ve exhausted your Netflix binge or want to feel less like a hermit from time to time, there are some great classes out there for all abilities. Community classes cost maybe a fiver a go or require a small donation. Plus, they are great social hubs for meeting new people. Check out this quirky article to find something new – yes, there are even Quidditch sessions! Living in London, you have entertainment at your doorstop – the West End is literally a tube ride away. Yet, we forget the cost involved when booking a hit musical or show. Theatre was created for the people, so why can’t we afford to go to it? Luckily there are some hacks to try out. The Top-Secret Comedy Club is the best for cheap laughs. It is potluck of the draw depending on the Comedians in the line up, but it costs a total of a £1 to get in! So, what have you got to lose? ‘Hamilton’ has been on for over a year now, and I am yet to see it. One day I will fork out the money for it, but for now I will keep trying my luck in the lottery. The more I enter the more chance I have of winning, right? Anyway, if you’re dying to see a musical but haven’t got the dosh, almost every show will have its own lottery happening for tickets. Otherwise, a great app that has a daily lottery and cheap West End tickets is LOVE Theatre. If you’re out and about in London, there’s no harm in heading down to a one of the Ticket Agent Booths in Leicester Square and ask what they have on sale cheap for that day. You may get a surprise. 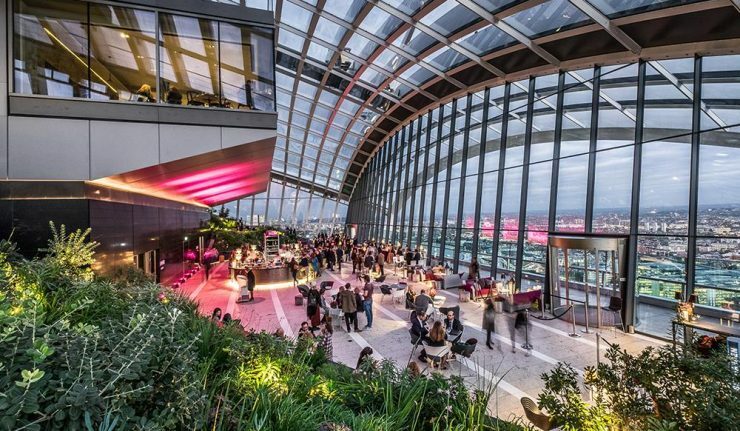 Unlike the Shard, which charges a small fortune to take the lift to the very top, it costs nothing to visit the Sky Garden. This is London’s highest public garden, so soak in the fact that London is an incredible city to live in. It’s easy to forget when you work in it! If you’re planning a small trip away to beat the blues, accommodation prices can sometimes be a killer. I recommend looking into what deals on AirBnB there are. It’s common that after the party season in January, hosts will drive down prices to bring in the guests. We’re feeling it; after a season of eating and drinking, it may be time for a light detox or exercise plan. Why not do while venturing out and into London’s best places. If you don’t have your own bike, there are of course the trusted and true Boris Bikes located all over the city to hire at a low cost. Plus, a great way to see Hyde Park among other beautiful London spots. Kew Gardens hosts a lovely day out, with their seasonal plant displays. January is a great time to dust off the cobwebs and explore these beautiful surroundings. Definitely worth checking out of what’s on offer – at no cost!